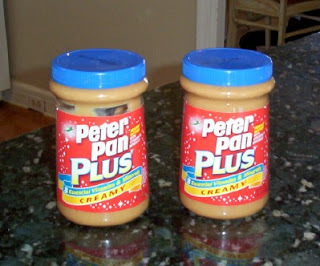 Do you have Peter Pan or Great Value (Walmart) brand peanut butter in your pantry? I did. Certain batches have been contaminated with salmonella, and the FDA is asking you to destroy those. Milehighmama has the scoop. Side note: For brand loyalists out there, this confirms that Peter Pan is the company that also manufactures Walmart's generic peanut butter. Thanks for the heads up. We are Jiff lovers here so we don't have any of this brand, but I'll mention it around. The codes on the recalled peanut butter start with 2111. I checked mine, and sure enough I had one starting with 2111. When my youngest was three she had salmonella, and was terribly sick. Toss the peanut butter, but keep the lid. You can mail them to the ConAgra corp. and they'll send you a refund. I'm going to try to return my GV brand PB to WalMart tomorrow, but if that doesn't work I'm definitely sending in my lids! Follow the link on my post for more details. There was a recall a long time ago for Tyson bags of frozen chicken, and Aldi had the info posted right next to their bags of frozen chicken. Hmmm. I just returned 4 jars to Publix. They were buy 1, get 1 free. I hated it that I had to take them back! I also loved that my suspicions were confirmed about the brands! I returned my GV recalled peanu butter to Wal-Mart, and they had several lids on the counter,and a couple of jars, too. They were very nice about refunding the money. Thank you so much! I couldn't figure out why me and my toddler have flu symptoms, and my 7 yr old couldn't quit throwing up. A day later and he's fine. I NEVER would have suspected peanut butter.